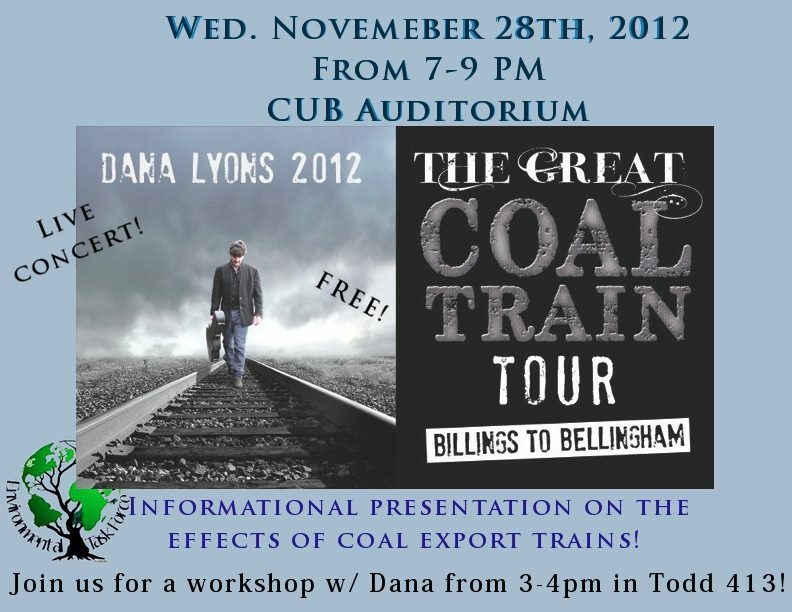 On Wednesday, November 28, performer and environmental educator Dana Lyons will bring his Great Coal Train Tour to Pullman, Washington, offering a community organizing workshop from 3 to 4 pm and a concert between 7 and 9 pm. Since September 8, he has visited dozens of communities throughout four Northwestern states, from Billings to Bellingham and from Portland to Coos Bay. Along the route of proposed coal export trains that could carry 160 million tons of coal per year from Montana and Wyoming to the Columbia River and West Coast and via supertanker to China, Dana’s fun, inspiring, and family-oriented concerts intermingled with place-based storytelling have fostered interest and understanding of this significant regional issue. Extending into 40-plus shows through April 13, his tour provides accurate and intricate descriptions of coal export impacts, as it catalyzes public engagement, discussion, and opposition to this regionally and globally detrimental scheme. Singer and guitarist Dana Lyons hails from Bellingham, Washington – ground-zero of Northwest resistance to coal exports, near the largest proposed coal port facility in North America, SSA Marine’s Gateway Pacific Terminal at Cherry Point. Best known for his comedy hit song Cows with Guns, Dana has recorded eight albums during his lifetime artistic career, including Circle the World and At Night They Howl at the Moon: Environmental Songs for Kids. Working around the Earth to raise awareness, activism, and funds for environmental and social justice issues, Dana has collaborated with Dr. Jane Goodall and her environmental group Roots and Shoots. Besides bolstering community knowledge of potential Northwest coal exports, Dana has been meeting, learning, and networking with local residents and organizers across the region who are working to stop proposed coal mines, trains, and ports for health, safety, traffic, economic, and environmental reasons. In response to decreasing domestic coal demand, the world’s largest suppliers, such as Arch Coal and Peabody Energy, plan to strip mine millions of tons of Powder River Basin coal in Montana and Wyoming and haul it on 50-plus, 1.5-mile-long trains per day to massive coal export terminals on the Columbia River and Pacific coast. 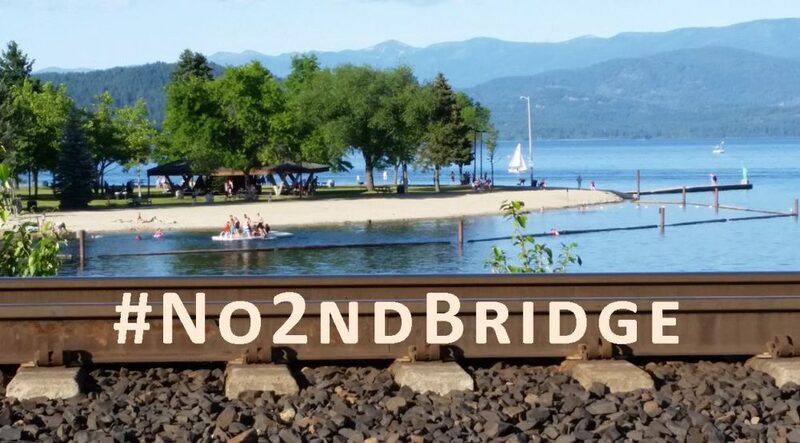 The targeted Burlington Northern Santa Fe rail corridor extends through Billings, Missoula, Sandpoint, and Spokane to the river gorge and five ports near Longview and Bellingham, Washington, and Boardman, St. Helens, and Coos Bay, Oregon. Because noisy coal trains spew toxic coal dust and diesel fumes, dangerous accidents and derailments, and block traffic and emergency responses, rail line communities anticipate adverse impacts to public health, quality of life, regional identity, and local jobs, businesses, property values, and economies. Substantial taxpayer investments would support the required coal export project infrastructure and mitigate predictable damages. Coal terminals and ship transport and subsequent Asian combustion would degrade air and water quality, jeopardize aquatic ecosystems and fisheries, and significantly exacerbate global climate change. While federal, state, and county agencies accept public comments on prospective coal ports at Boardman, Oregon, and Cherry Point, the Washington State University (WSU) Environmental Task Force and Environmental Science Club are hosting this free workshop and live concert. The student groups invite the public to Dana’s performance between 7 and 9 pm on Wednesday, November 28, in the Compton Union Building (CUB) Auditorium, and to his workshop on Community Organizing to Stop the Coal Trains from 3 to 4 pm in Todd Hall 413, both on the WSU campus in Pullman, Washington. For further event information, please visit Dana’s website and explore his music, videos, merchandise, and tour schedule and listen to his coal train song, Sometimes. To learn more about proposed regional coal exports, visit Coal Train Facts, Power Past Coal, Coal-Free-Bellingham, and WildIdahoRisingTide.org.